I made these last week and they were fantastic – comforting and homely with a good old-fashioned meatball taste (more school dinner or granny’s kitchen than IKEA). Ben said they tasted just like faggots but I disagreed (there is no offal involved for starters, which is good because I hate offal). Everyone in our house loved them and I will definitely be making them again. I recently began a subscription to Honest Brew beer delivery service. The idea behind it being that I should drink LESS but BETTER beer. It’s expensive (£36 a month for 12 beers, which I have to share with Ben!) but I drink less so it sort of evens itself out. I get very excited when the delivery arrives (sad, I know). Aside from interesting tasting beers I take a huge amount of pleasure in the beautifully designed beer labels – the creative collaboration between illustrators and craft beer makers is a truly wonderful thing indeed. I used this tasty little number from Siren Craft Brew for the beer gravy with my meatballs. Fry the diced onion gently in a little oil until soft (about 10 minutes) and leave to cool (I missed this bit by accident and added it to the meatball mix raw – the results were still good). In a large bowl add all the meatball ingredients and mix thoroughly with your hands. The more you mix the better the meatballs will hold together. Cover the bowl with cling film and chill in the fridge overnight (or for at least an hour). Divide the mixture into quarters and then divide each quarter into six and roll each portion into a ball so you have 24 meatballs. Put them on a plate and cover and chill again for 30 minutes in the fridge. Fry the meatballs in a little vegetable oil until well browned on all sides. They do not need to be cooked all the way through. Put them into an oven proof serving dish. Turn on the oven to 190oC. To make the gravy, put the onion, garlic, rosemary and 250ml of beer in a saucepan. Simmer gently for about 10 minutes until the onions are soft and almost all the beer has evaporated. Add the stock and reduce by about a third. Pour the gravy through a sieve over the meatballs and bake them (uncovered) in the oven for 20 minutes until the gravy has thickened and the meatballs are cooked through. To finish pour in the remaining beer, sprinkle over some fresh sage (or I used parsley) and give everything a good stir. I thought it sounded strange to add ‘raw’ beer to the mix at the end but trust me it really does work. Tom serves his meatballs with buttered peas and mushrooms. I served mine with homemade potato wedges (I really wanted oven chips). But they would also be good with mash, rice, spaghetti – pretty much anything really. The weather forecast is not showing any sun for the next week so why not brighten up your days with these colourful, flavoursome little parcels. I made these a few weeks ago and they were delicious. If you can’t be bothered with the filo pastry part (or if you’re on a diet and have declared pastry to be the devil) then just make the filling and eat it as a dish in itself. This week is British Pie Week (sponsored by Jus-Rol!). Whilst I wouldn’t ordinarily put these in the ‘pie’ category they do seems to fit the Oxford English Dictionary’s ‘pie’ definition. Pie: a baked dish of fruit, or meat and vegetables, typically with a top and base of pastry. So go on eat a pie and celebrate. Here are some other pie recipes on this blog (note to self – I need more). Makes 6 parcels (for me anyway, somehow Tom managed to get 12-14 from this quantity of filo). Six parcels fed my husband and I heartily as a main meal (but we are pigs, I’m sure normal people with average appetites would be perfectly content with two each). 1 x 250g packet of filo pastry (I’m unsure whether Tom’s printed quantity of filo is correct. I only seemed to have enough to use up half the filling. The rest I ate cold for lunch with some salad. Next time I’ll buy two packs of filo or half the quantity of filling). Put the couscous into a bowl and pour over enough boiling chicken stock to just cover. Mix with a fork, cover with cling film and leave to stand while you prepare the lamb. Spread the lamb out on a baking tray and put in the preheated oven. Cook for 15-20 minutes until brown and crisp stirring a couple of times to break it up. Drain off the fat and set aside. In a heavy bottomed pan fry the onions and garlic in a little oil for 10 minutes on a gentle heat. Then stir in the turmeric and cumin and cook for a further 3-4 minutes. Add the lamb to the pan and cover with 200g of chicken stock. Bring the mixture to the boil and reduce until almost all the liquid has evaporated. Then add the sultanas (or apricots) and couscous and mix well to combine. Leave to cool. When the mixture is completely cold add the feta and coriander and season well with salt and pepper. You can stop here if you like and forget about making into parcels. To make the parcels, first preheat the oven to 190oC. Then melt some butter. I start with melting 50g in a microwave and then melt more if required so that I don’t waste any. Cut the filo sheets in half lengthways so that you have long strips. Take one filo strip and brush with melted butter. Put another strip on top and place a large spoonful of the filling in one corner of the pastry in a triangle shape leaving a 1cm border all around. Then carefully lift the corner of the pastry with the filling over itself on the diagonal to create a neat triangle. Continue folding the triangle so that the filling is encased in several layers of filo (you will need to fold the mixture over at least four times so that all sides of the triangle are sealed). Continue until you have used up all the filo strips. Place the parcels on a thin baking tray lined with baking parchment. Brush the parcels lightly with butter and dust lightly with icing sugar and cinnamon. Bake for 25 minutes until golden and crispy. Serve with a cucumber salad and yogurt. I’m not sure how you make tapenade look appetising. My husband is very good in the kitchen but a routine has developed whereby he will cook just once a week (usually on a Friday) and completely steal the show with something new, AND complicated, AND completely delicious. I meanwhile do the everyday scrap cooking that barely gets noticed. Just a little bit annoying. Last Friday he went all out making two types of fish cake as a starter (show-off), followed by Tom Kerridge’s ‘Tomato and olive tart with Cornish gurnard’ for the main course. The tart was really good but it was the tapenade spread over the base that completely blew me away. So make loads and then keep it in the fridge in a very clean jam jar covered with a layer of olive oil. I’m not sure how long it lasts but I reckon two or three weeks would be fine because it uses ingredients that have already been preserved in some way. In my usual ‘make do’ style it was me that used up the remaining tapenade in Monday night’s dinner – mixed up with orzo, leftover cooked sausage, a bit of mozzarella, a few black olives and some dog-eared basil leaves (AKA ‘chuck everything in the fridge in with some pasta’). Put all the ingredients, except the oil, into a food processor and blitz until finely chopped. Add the olive oil and blitz again until you have a thick puree. Store in a clean jam jar in the fridge until ready to use. Please look at the chickpeas here. I was flicking through Tom Kerridge’s ‘Best Ever Dishes’ and was drawn to a recipe for ‘Skate with crunchy chickpeas’. I couldn’t find skate and so my husband pan fried some sea bass instead. The crunchy chickpeas though were a revelation. It’s nice to have something a bit different carbwise from the usual rice/pasta/potatoes (although note the sneaky saute potatoes in the photo above that I added at the last minute to pacify my carboholic husband). 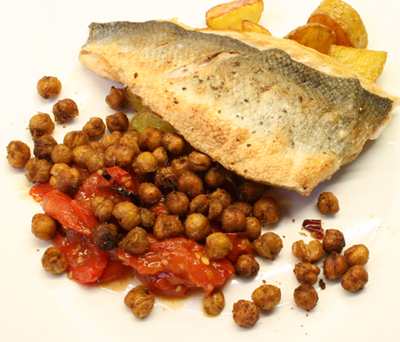 Cooled down and on their own the chickpeas taste a bit like an upmarket Bombay mix. They would make a great alternative to crisps as a pre-dinner snack. Heat the oven to 180oC. Mix all the ingredients above in a large bowl. Spread the spice covered chickpeas evenly on a large baking tray. Bake for 35-45 minutes until they are crunchy. I don’t believe in Valentine’s Day, but if I did this is what I’d make for my husband. Our very good friends Jonny and Becca cooked this wonderful pie for us recently and I was so impressed that I had to buy the book (Tom Kerridge’s ‘Best ever dishes’) so that I could try it for myself. 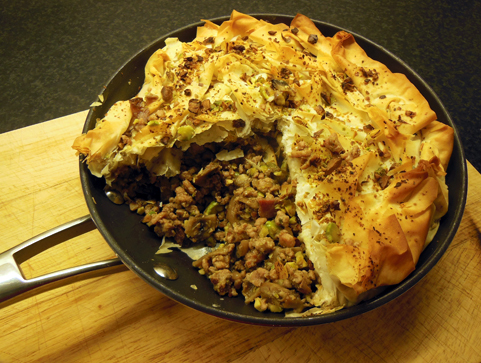 The recipe requires a few special ingredients which are probably not on your usual shopping list (brined peppercorns, pistachios, filo pastry) but I promise that it’s well worth the effort. The original recipe uses chicken mince but Tom does say that you can also use pork. This is what I did because chicken mince is not that easy to come by (my butcher could have minced some chicken especially for me but it would have been very expensive). Warm a saucepan over a medium heat, add a little oil and add the bacon. Cook until brown and then add the pork mince and cook until golden brown. If a lot of fat has come out of the meat then drain the mince over a colander over a bowl. Add the fat back to the pan, turn the heat down to low, then add the onion and garlic and cook until brown (about 10 minutes). If your meat is very lean then remove the meat from the pan and add a little more oil before frying the garlic and onion. Once the onion and garlic are soft, tip in the mushrooms, cooked mince and chicken stock and bring to a simmer. Cook for 15 minutes until the sauce has reduced and thickened. Remove from the heat and add the green peppercorns, most of the pistachios and the fresh oregano. Check the seasoning and add more salt if necessary. Leave to cool. Take a 20cm diameter cast-iron dish or oven proof frying pan and brush with melted butter. Take a sheet of filo pastry and brush with a little melted butter. Sprinkle on a little dried oregano then cover with the next layer of filo. Brush that with butter and sprinkle with oregano and then continue until you have 7 layers of pastry. Don’t be scared if the filo cracks a bit but work quickly so that it doesn’t dry out too much. Put the filo layers into the dish/frying pan and then spoon in the filling pushing it right up to the edges. Then bring the overlapping pieces up over the top of the filling. Take another sheet of filo pastry and place over the top, brush with butter and sprinkle with oregano and repeat until you have 5 layers. I crinkled the ones that ended up over the edge of the pan back on to the top of the pie. I then brushed the whole top liberally with butter and sprinkled over the remaining pistachios. Bake for 15 minutes in an oven preheated to 200oC until the top is crisp and golden. I served with steamed greens but I think it would also taste great with a simple green salad. It always terrifies me when really good chefs get their own TV series, so I was filled with trepidation when I turned on Tom Kerridge’s ‘Proper Pub Food’ on Monday night. Luckily they hadn’t turned him into a clown for the occasion (Hairy Bikers style), but I have to say that whilst I really enjoyed the programme, I did feel as though I was going to have a heart attack just watching it. There wasn’t a vegetable in sight until he prepared some to go in his salt beef bagel by pickling in a load of sugar! Still, I found the unapologetic gluttony strangely refreshing in this age of nutritional over-analysis where we seem to be constantly lectured on what is, and isn’t, good for us. So it is in this spirit that I offer you another recipe from Sarah Raven’s brilliant ‘Garden Cook Book’. I attempted this at the weekend when my parents bought me over a lovely large bag of juicy ripe plums from their garden. It’s a fantastic way to turn a healthy plum into something very, very naughty indeed. Use a 25 cm sauté pan or a cast iron frying pan, one with a removable handle, or one which can go in the oven handle and all like mine. Preheat your oven to 170oC. 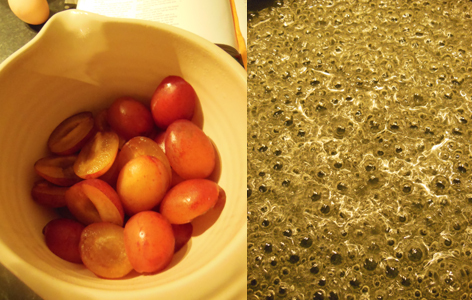 Prepare the plums by halving and stoning them. Put 275g sugar and 150ml water into the pan and stir over a medium heat until the sugar dissolves, then cook without stirring until the sugar caramelises to a golden brown. The trick here is to keep an eye on it and do not leave the side of the pan even for a moment. Once the caramel starts to colour it does so very rapidly and it will keep cooking even once you have taken it off the heat. 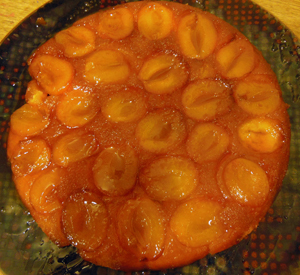 Arrange the prepared plums cut side down in a single layer over the caramel in the pan. Put the butter, remaining sugar and flour into a food processor and whiz for a second or two. Add the eggs and stop whizzing as soon as the mixture comes together. Spoon over the plums and spread gently in as even a layer as possible. The plums will poke through a little bit but don’t worry about this. Bake in a preheated oven for about 1 hour. The centre should be firm and the edges shrunk slightly away from the sides of the pan. Allow to rest in the pan for a few minute before taking a deep breath and flipping over onto a serving plate. 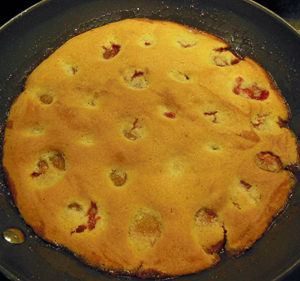 NOTE: My frying pan was only 22 cm across the bottom so I halved and stoned enough plums to lay in a single layer over the bottom. I then weighed them. They came to roughly half the amount used in the recipe above so I just halved all the other ingredients. I then cooked for 40 minutes rather than 1 hour and this was just right. After turning out. Not the best photo as I’d had a glass or two by this point and the steam kept fogging up my camera.